The stakes in today's public policy debates are as high as they've ever been. So, how does a nonprofit organization separate legitimate and perceived barriers to find the sweet spot for maximum engagement and not cross the lobbying line? The three panelists on the “Strategic Advocacy: Winning Policy Change without Crossing the Lobbying Line” webinar held March 14, 2019, covered the fine points of where to draw the line between lobbying and non-lobbying activities. They also provided useful tips and ideas for effective advocacy—both under the arc of “being braver because our kids need us,” said presenter Kelly Hardy of Children Now. By knowing the legal restrictions—what is allowed and what is not for different organizations and individuals—advocates can confidently exercise their rights and responsibilities in the “ecosystem of policy change,” said attorney Allen Mattison. He detailed how nonprofits can understand where the legal lines are drawn and how people can be clear about the roles they can play in influencing policy in their capacity as government employees, social service providers, teachers or other positions they might hold. In addition to providing practical guidance about what is allowed and not allowed under the law, the webinar also covered strategies for effective advocacy. Each of the three presenters—Mattison, Hardy, and Jeff Hild with Building Community Resilience at the Milken Institute School of Public Health at George Washington University—provided strategic advice for planning the spectrum of activity from individual educational efforts to full campaigns, involving multiple organizations. Mattison reminded participants of the many “pressure points” to influence policy by using op-eds and social media, and finding multiple venues that may not come to mind immediately (e.g., churches and mosques). Hardy’s comments drew upon her experience with the California Campaign to Counter Childhood Adversity (4CA), which included tools and strategies developed for a Policymaker Education Day, being planned this year for May 1. Hild emphasized the importance of using data and stories in combination to maximize the impact of your message with legislators and their staffs. A resource list of briefs, tools, fact sheets and other policy-related documents is attached to this post and included in the archive of the webinar. One resource is a two-page fact sheet, “Lobbying Basics”, prepared by Mattison that provides an outline for the key facts on the issue of lobbying vs. advocacy. 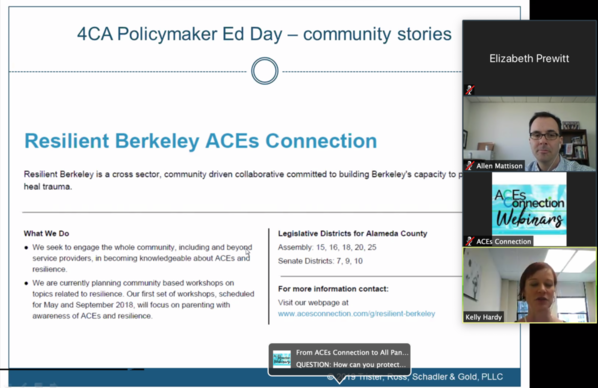 The webinar was hosted by ACEs Connection and the Campaign for Trauma-Informed Policy and Practice (CTIPP), and co-sponsored by California Campaign to Counter Childhood Adversity (4CA) and the National Center on Domestic Violence, Trauma & Mental Health. This is the third in the 2019 series, State-to-State Sharing of Best Practices. The first webinar covered Alaska’s new statute directing state policy to incorporate principles of brain development; the second webinar featured the Self-Healing Communities Model presented by Laura Porter of ACE Interface. For the video, slides and other information related to these webinars, click here for the webinar archive section on ACEs Connection. Andrea Blanch, an independent consultant on trauma and mental health, and I moderated the webinar. Jessica, For the video, slides and other information related to these webinars, click here for the webinar archive section on ACEs Connection. And please feel free to share! Does anyone know if the webinar was recorded and if it will be available for sharing? Thanks!